The Studiologic Sledge 2.0 61 Key Synthesizer is the black edition of the original synthesiser, offering enhancements to the sledges output level to provide a bigger sound. With new modulation features and sounds, the Sledge black also possesses a wide variety of different signature sound-sets from top musicians. The Sledge 2.0 uses modelling and filtering technology from Waldorf, providing a sound engine that is both expressive and responsive. The Black Edition offers a complete black finish with the exception of two orange knobs, creating an incredible looking synthesiser that can produce incredible sounds. Not only does the black edition of Studiologic’s Sledge 2.0 synthesiser provide a sleek black finish with two orange knobs and reverse black, grey keys, but enhances the sound and features to provide even more sound possibilities. The synthesisers semi-weighted keys are given new balance springs to provide an even smoother feel for a more satisfying playing experience. 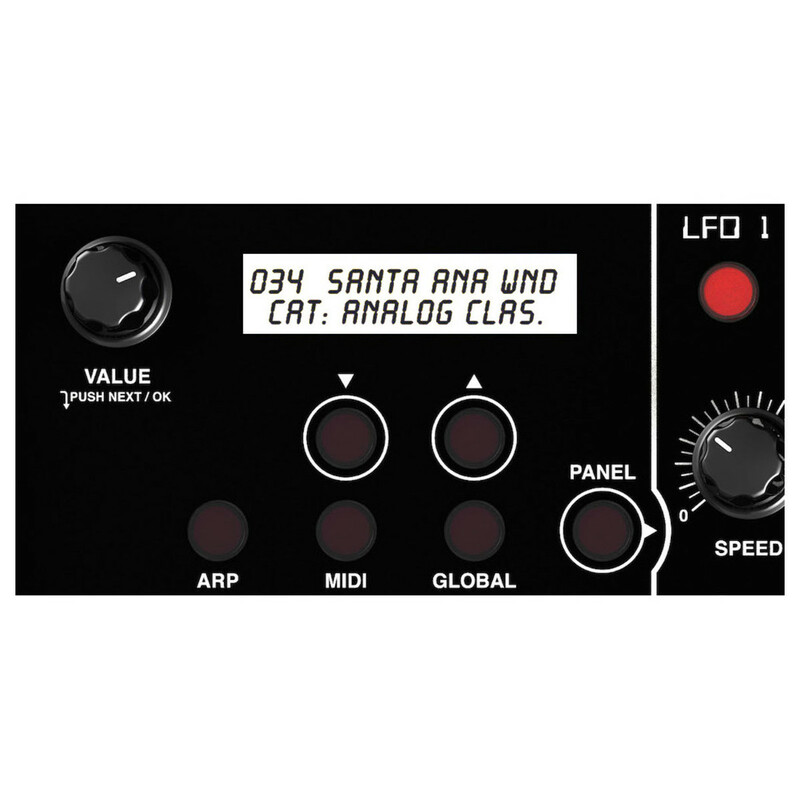 The audio output level has been enhanced, creating a sound that is stronger, cleaner, and fatter, whilst the Sledges LFO2 has been synchronised to keep the same modulation phase across all the notes. To finish of the black edition’s improvements, Studiologic got a variety of top musicians to contribute signature sound-sets, and added new features to improve the synth’s warm, crisp sound. The Studiologic Sledge offers a wide range of different sonic options, with a mix of pure synthesis and sound sampling. Possessing an incredible sound engine and a vintage control panel that’s very user-friendly, the studio 2.0 is a very flexible instrument with the ability to play in dual mode, running two programs at the same time. The auto dual mode can be used in either split of layer mode, with the ability to permanently store the combinations in any of the 1,000 available presets. The synthesiser also features a sample player, pitch and hold controls, reverb and delay and an polyphony of 24 for real time control over the sounds that can be produced. With the Sledge 2.0 come the Sledge Spectre, a tool for creating and transferring sample content from a computer the synthesiser. The tool also provides the ability to play back samples, allowing you to hear all the different samples. With this tool you can edits your samples on a computer until you get the sound you want and then transferred via USB directly into the Sledge where they are stored on its internal memory.